A beautiful vintage design featuring elegant vines and hand finished off with crystals, giving it a sparkling touch. Available in a choice of 3 colours. Please note - due to the handmade process, express service is not available and the turnaround time for this product will be approximately 10 working days. 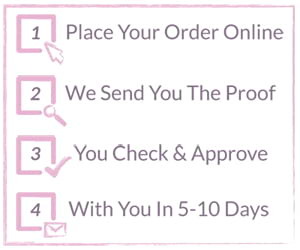 After you place your order we will send you a proof (if the product requires) which you will need to check and approve. If you aren't happy with the wording or need any amends we will change this (free of charge!) until it is perfect for your big day! Once you approve your wording it will arrive within 5-10 working days.